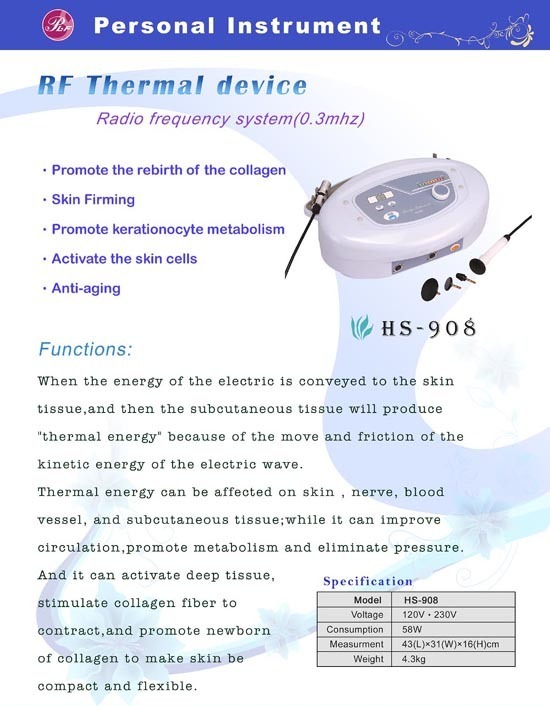 Taiwan Skin Care Equipment(HS-908), Skin Care Equipment, Beauty Equipments - Palifull Co., Ltd. When the energy of the electric is conveyed to the skin tissue,and then the subcutaneous tissue will produce "thermal energy" because of the move and friction of the kinetic energy of the electric wave. Thermal energy can be affected on skin, nerve, blood vessel, and subcutaneous tissue;while it can improve circulation,promote metabolism and eliminate pressure. And it can activate deep tissue,stimulate collagen fiber to contract,and promote newborn of collagen to make skin be compact and flexible.